During Japan's Warring States Period many powerful feudal lords took it upon themselves to pillage neighbouring lands whenever the opportunity arose. As steps towards unifying the whole country began, battles unfolded and many men left the smaller villages to fight in the larger territories. Among those left behind to tend to the farmlands were groups of hoodlum youths, referred to as "Evil Little Devils", who, dreaming of supplanting their superiors, spent much of their time brawling and "stealing" neighbouring villages. In the small rural village of Kinugasa, three teenage farmhands, Ryu, Gon and Yonesuke, sought to break the monotony of their agricultural chores by training themselves in the Japanese martial arts, particularly swordsmanship, and employing their burgeoning skills in mock raids on the villages' of their rivals. 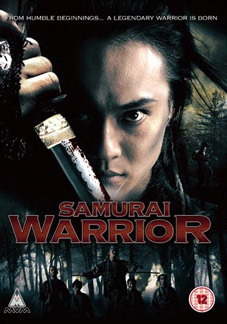 But their superiority in the relatively harmless arena of adolescent warfare becomes threatened and things turn deadly when a young warrior, Jojima, returns from the real battlefield and attempts to exert his dominance over the three friends. Adding a neat strain of light humour and a touch of romance to a compelling story of loyalty, brotherhood and courage, director Nishiumi delivers an amiable samurai saga that culminates in a gripping sword-swinging climax. A former assistant director to prolific and controversial filmmaker Takashi Miike and now an equally maverick director in his own right, Kenichiro Nishiumi is the man behind Samurai Warrior, a period-set martial arts action saga starring Yuma Ishigaki (13 Assassins) and Suzunosuke (Crows Zero 1 and II; Cyborg Girl). Samurai Warrior (cert. 12) will be released on UK DVD by MVM on 27th February 2012 by £15.99.